Access to locally grown, fresh fruits and vegetables is essential to healthy families and healthy communities. We are proud to help connect local families to local farmers through food benefit programs. Vendors can't give change for tokens or coupons. It's a good idea to have some cash with you to make up small differences. Visit the Market Manager's tent to get started. Use your SquaresVT card to buy fresh, local foods at our market. All of the farms, chefs, and bakers at the market accept the $1 tokens you buy with your card. To use your card, visit the Market Manager's tent. Swipe your card to buy $1 tokens that can be used at our locations in South Hero and Grand Isle (but not at other Farmers' Markets). Spend tokens at any vendor's tent displaying the SquaresVT acceptance poster. Save unused tokens for another day. There is no time limit. Or, you may return unused tokens for a refund on your card. Jams, preserves, sauces, soups, etc. 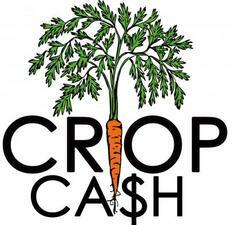 Double your 3SquaresVT benefit with Crop Ca$h ! When you use $10 of your 3Squares benefits at either of our markets, the market manager will give you a Crop Ca$h coupon worth $10. You can receive matching Crop Ca$h coupons twice a week. Just use your 3SquaresVT benefit at both our Wednesday and Saturday markets. seeds or starts for fruits or vegetables. Tip: Use your Crop Cash first to buy fruits and vegetables. Save your other $1 market tokens for all other food products (meats, cheese, bread) and/or to buy additional fruits and vegetables. If you are enrolled in WIC, WIC provides your coupons. Community Action Agencies distribute coupons to other income-eligible families. Call the Champlain Valley Office of Economic Opportunity at 1-800-300-7392 for more information. Coupons are distributed beginning in late June. They are worth $6 each and expire on Oct 31st. Spend them at any farmers’ market tent displaying a Farm to Family poster. With these coupons you may buy only fresh fruits, fresh vegetables and fresh-cut herbs. 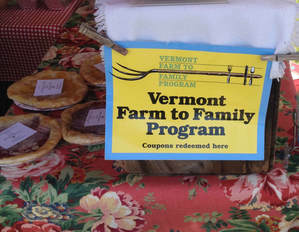 Visit our Market Manager's tent or the Vermont Department of Health's web page for more information about WIC and the Farm to Family Program.